Hey everybody, I hope you’re well and happy and ready to learn something fun and new about powered hair maintenance. Like, when are you not? Today we’ll be checking out the Norelco Multigroom 3100 vs the Norelco Multigroom 5100. Clearly, the product people at Philips Norelco thought their customers were just soooo choosy they had to offer them two slightly different trimmers. So we’ve spent some time examining the Multigroom 3100 and the Multigroom 5100 and are here to tell you what the difference is, and which is better. Ready for a SPOILER? Out of the two, we choose the 3100. Want to find out why this sub-$20 (usually!) shaver beats the big bad 5100? Read on and find out. So let’s just remind ourselves – this is a groomer currently retailing at $16.95 (check the latest price here at Amazon – they just love fiddling with the prices!). So at that price-point how much can we expect? You get a solid trimmer with self-sharpening blades that has all the attachments required to trim your various facial hairs. That’s to say – you get two ‘trimmer combs’ (I’d call them guards) that slide up and down to provide 18 different positions each. These work quite well as long as you don’t smoosh the trimmer into your face like a mad man – this will force the guard/comb backwards and you’ll find yourself trimming much closer than you meant to! If you can avoid that, you’re going to get a good trim with this model. One of the guards is big, and the other small. The small one is meant for your beard, and the big one for your hair/Zac Galifianakis style facial jungle. The Multigroom 3100 also comes with a nose-hair trimmer (Interested in more nose hair trimmers? see our other reviews here) for the well-groomed nostril and a precision trimmer in case you want to get all OCD about your beard. That’s all well and good. Here’s what’s going to annoy you: no bag, no stand, and no operation while plugged in to the wall. The bag and stand I can live without. It’s not until the $200-$300 electric shavers that we see any serious quality in this regard. But the lack of corded operation is just a killer – for some people. Me, not so much. While it takes 10 whole hours to fully charge, that charge time gives you 35 minutes of solid operation. That’s plenty for me. I mow my beard maybe once a week (gotta look good on Monday morning!) so I’m good with the big charge time. It really really looks like you should be able to use the thing plugged in. There’s the groomer, the cord, and your wall. Join everything up and away you go! Except it doesn’t work that way. The trimmer actually runs off the battery 100% of the time. The cable sends power to the battery and nowhere else. This means that if the trimmer’s out of battery, you’re out of luck and waiting 10 hours for your next shave. And if the battery dies, you’re really out of luck and need a new trimmer. But hey, for pure value I really don’t think you’re going to do better. For more details about this trimmer, check it out on Amazon. Righto, what does an extra $15 get you in the beard trimmer market? Let’s find out. A hair “comb” (I still say guard, because it sounds like you’re supposed to comb your hair with this baby. Believe me, that’s not going to work). A stubble guard (or comb, sigh). A lithium-ion battery that takes only one hour to charge. Not 10 hours. One hour. Let’s go over a couple of these points in more detail. First of all, unless you have the softest of soft stubble, that foil shaver isn’t going to do a lot for you. While my whiskers are a little patchy, I need something in the order of 350 cubic inches of power to get through some of them. This sucker isn’t going to do it. The battery is a massive improvement. 60 minutes of charging, and those charming people at Philips Norelco claim that the 5100 Multigroom will provide “up to 60 minutes” of run time. I’ll take that with a grain of salt, but it beats the pants off the 3100’s 35 minutes operation from 10 hours charging. And Turbo. Turbo. My car doesn’t have turbo. Unfortunately, this doesn’t mean it has an internal combustion engine with forced induction. It means that it has a switch on it to make the cutting blades go faster. That’s all well and good, but what’s the problem? The 5100 shares a problem with the 3100 in that it can’t be used plugged in. But the biggest problem is that there seems to be a problem with the way the combs attach to the trimmer. Many customers have found that the trimmer works fantastically for a few months, but after that the guards fit loosely, rattle around, shave poorly and make a lot of noise. 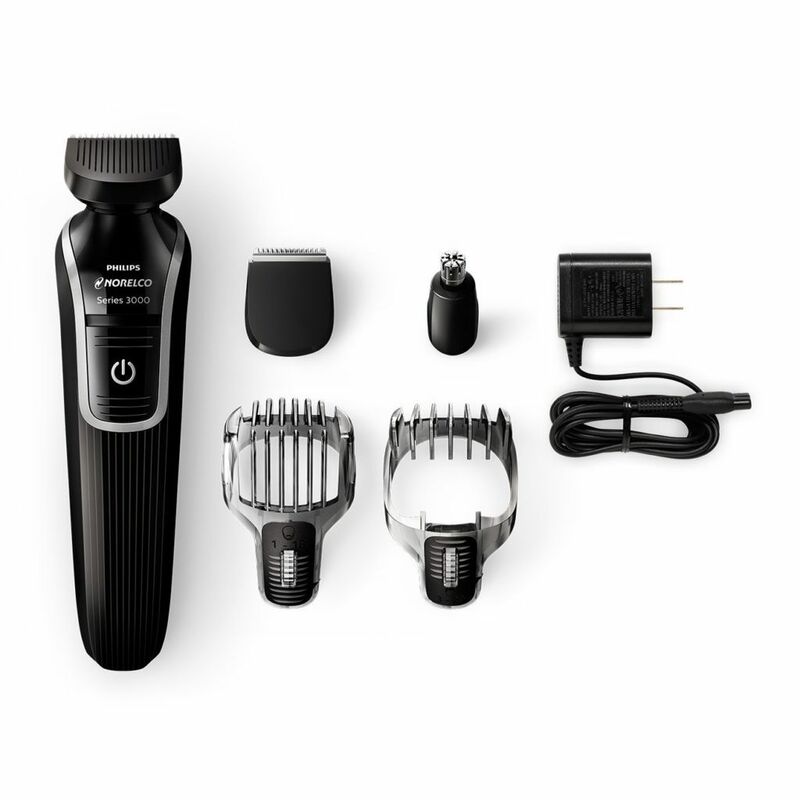 Fortunately the trimmer comes with a 12 month replacement warranty, and a 45-day tryout period where you can return it and get your money back. 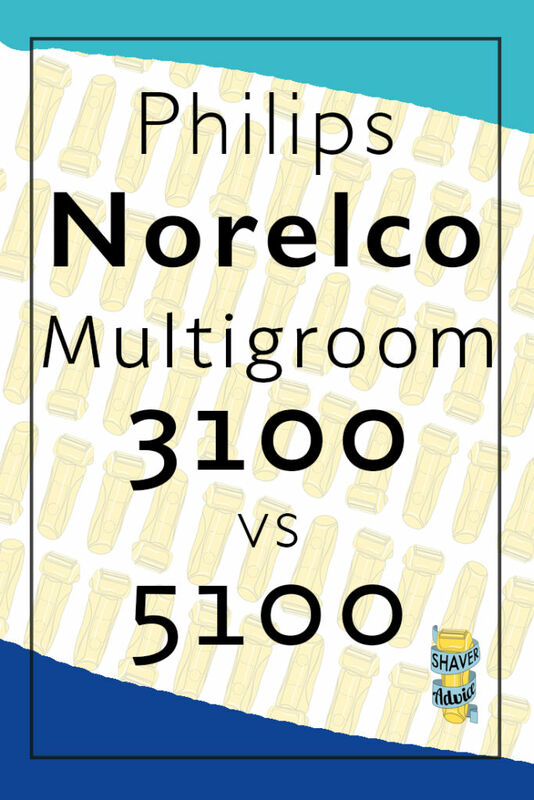 So despite some problems, Philips Norelco have worked really hard to give you a good deal on the 5100 Multigroom. Like I said at the beginning, we’ve come down on the side of the Mutigroom 3100. 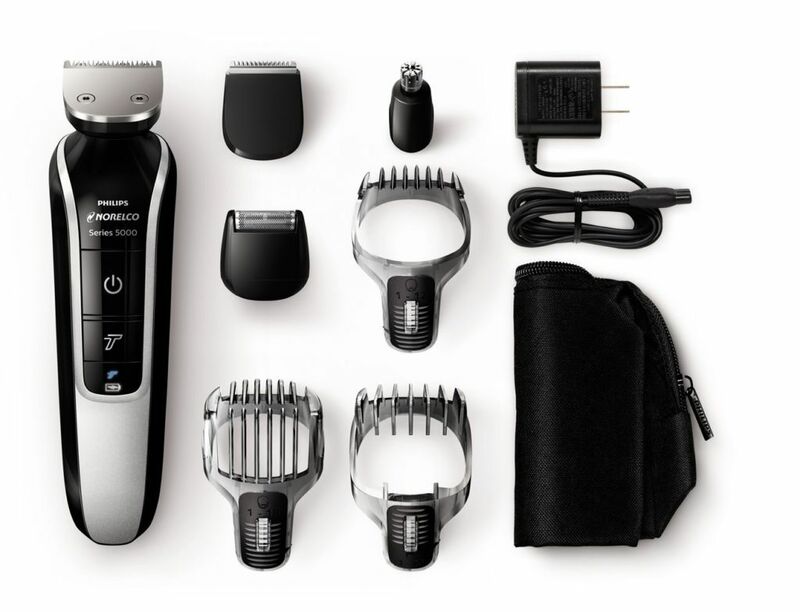 This is because that even at the lower price we believe you’re going to get more use out of the 3100, and that it does a credible job for the devices stated purpose – trimming your beard and mustache. And at the price the 3100 is offered at, the 5100 can’t compete. Care to check out some other options? 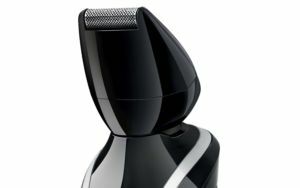 Take a look at our complete and in-depth beard trimmer review page here.